With a direct link to Hi-Level your website will always be up to date with the latest stock levels and prices. This means if a part goes out of stock at Hi-Level, your website will also go out of stock. We can also link your website to Bike-It inventory and coming soon is Feridax. You can create your own product pages on your new site. Ideal if you sell new or used motorbikes as you can list every bike you sell with multiple pictures. If you have a service centre or workshop you can create pages detailing your services and upload images. 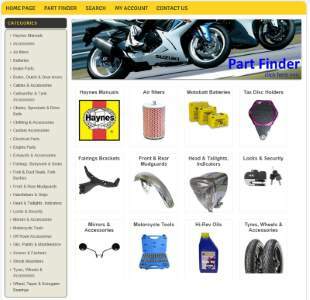 Hi-Level Part Finder provides you and your customers a quick and easy way to lookup part compatbility data for over twenty thousand motorbike parts. Your new site has Part Finder built in allowing your customers to quickly find the part they need. Also included is Parts Fitment Data on every part page. Updates are included as soon as they happen at Hi-Level. Your ecommerce website will be enabled for credit card, debit card and PayPal payments from over 100 countries around the world. Payments are deposited direct to your bank. Built in SSL means your customers see the padlock symbol and know the information they share with your site is encrypted. We can arrange fulfiment of your website orders for Hi-Level parts straight to your customer. This means you do not have to hold stock. Of course you can fulfil orders yourself, or have us fulfil some and you do some from your stock. You have a range of flexible options.